Wow! We’re there! 3000+! To help celebrate the event, over the next little while you’ll see some fun interactive posts come up, with the intention to inspire, teach and encourage you. You’re here for DIY decorating, so that’s what I aim to deliver! When I gutted my own home to restage my mom’s (post about that HERE), I left empty holes everywhere you looked. It was pretty depressing. So… I finally did something about it. Need height somewhere? Stack’em up! And then hug it all together with a long dangly fake lovely lush green plant. Moral of this story is, if one is not enough, take a few and try stacking them. Allow your vignettes to tell a story that make YOU smile. Bet you didn’t realize I had sculpture magic inside these rusty veins, eh? How sophisticated are these contraptions I ask? 🙂 I scooped these precious beings from my big rust junkin’ day. Ok, this one makes me squeal just a little. Some bent up metal basket hugging all kinds of typography goodness. Yum! I love decorating in groups. Why, I even wrote a post showing you all my groupings not long ago HERE. Groups emphasis your treasures in a unique way, so group’em up! Anything that holds anything can hold anything. This cute little curbside found bench is also sitting at my mom’s house. In order to enhance the top, I simply added loose palette boards. By this, I’m referring to substrates all on their own. This vignette (again at my mom’s) needed some height to compensate for vaulted ceilings, so simple pickets standing on their sides fit the bill. Same deal with the loose palette boards I brought. I had NO idea where I’d use this stuff but I just made it work in the right places. You just need to play, make mistakes and do it again until it works. As you can see, there really ARE no rules when playing around with this kinda stuff. You tweak things until they just feel and look good to you, tell a story, and show your little areas to their best advantage. I actually have a secret to my vignettes. Wanna know what it is? Take a look at all the vignettes above. They ALL have something in common except for the first basket one. See if you can’t pick it out before you read on. None of the objects are crafted. The items you see here are displayed in their authentic form. Sometimes the item left AS IS is actually perfect. Painting, tweaking, adding this and that can actually remove vintage rustic charm. It’s a very different take if you’re use to tweaking everything you get your hands on. Some things are better played with. But sometimes they’re perfect as is too. Here’s my little challenge to you. Try a new vignette with junk. And do NOT craft the objects. Just display them as is. Group them, put stuff in them, place them here and there. Just don’t tamper with their originality. Now, this is meant to be a quick fast one so please don’t distraught over the linkup below. Whip up something quick and linker up if you wish! Or just do it on your own and enjoy the fact that the paint can wait another day this round. The link will be up for a week. What do you think? Can you feel the love in all things rustic left untouched or do you tend to see all the help the objects need instead? is still open for entries! I have a question for you.. How did you get so many followers? Congrats on you achievement! That’s quite an accomplishment – Be proud! My bloggerversary is coming up soon (1 year on Oct. 22) You give me hope and a goal to shoot for! I’d like to link-up to your party, but I don’t know if my post qualifies – It’s a mixture of thrift, recycled wine bottles, DIY, and some store bought stuff. It’s a Hitchcock inspired Halloween Hallway. Come take a peak & let me know if I can join! Thanks again for your inspiration and for hosting. And CONGRATS!!! Chandler, I’m totally WOWed at the number. I never take it for granted. As for how to grow a blog, I did a post on how to build up your blog with blog growing types of posts. I believe this is how. I appreciate each one of you! 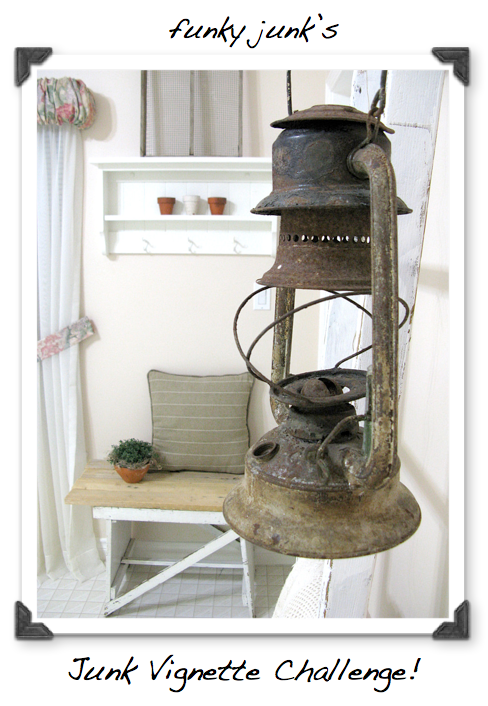 Thank-you for tuning into this little blog for more junkin’ know how. That’s what this Follower’s Event is all about this round. Simply put, celebrating DIY decorating. I’m LUSTING in a weird rusty love kind of way, after your basket of number goodness! I. LOVE. THAT. FIVE! …oh yes, and I’ll be happy to have 300 followers! CONGRATS on your 3000! Holy Canoli! This is so timely because I’m slowly learning to love things I pick up ‘as is’. Like the shutters I used on my mantel. I painted a larger set, but these I’m keeping brown with their wee enamel knobs and rusty brass hinges. Or the window thingamabob I hung over my bed. Just stapled some fabric to the back. I notice I’m not as keen on buying ‘already junkified’ pieces at places like TJ Maxx either. It’s too fakey. The ReStore is my favorite place to find good old rusty junk for a song. This is terrific because I love not doing anything to the junk but maybe wipe it off! I like the old crustiness of some things as is. I’m in love with the basket of numbers. I have no numbers, how sad is that? I love it!! The plant in the blender is the best!! All your ‘junk’ is so beautiful!! I do believe this is my basis of all of my decorating! And especially love your basket o’ numbers. Love the numbers & letters! I LOVE the basket of numbers. You put things together in such an awesome way! I am always inspired by your creativity… and I love junk, so your style makes my heart happy! Congrats on your 3000+! I love to see how you “junk”–you have a great eye! Hi there Donna! I’m lovin’ your “junky” vignettes… beautiful! Thanks for the challenge… it was fun! I LOVE the cd holder! Love the meat grinder full of pencils, but I’m wondering if it would actually grind them. My children would try. Oh Donna I love your junk! lol. I, too, love your comment… If someone looks at your stuff weird, you have achieved greatness! You really have a gift at making junk look stylish! Adore the group of numbers in the wire basket. Fun display! Look at this awesome-ness you inspired Donna! We are all so fortunate to have you in our lives (even if it is only online). I cannot tell you how much of my house I’ve redone since I found your blog in July. Even though my husband looked at me weird (and often scolded me) when I brought home “junk”, he admits now that our house has never looked so good, and it feels good to be here – it really reflects us, how we live, the things we love, and it makes me extremely happy just to walk through those rooms where as previously I just avoided them! What a blessing you have been to me and my family in such a short amount of time! PS – I would love to have a link party of what people do with all of these entertainment centers that are becoming obsolete. The only thing I can find is a kid’s kitchen, but I’m sure there has to be more! Stencialing with a over head projector …. What step do I take to use it ?? ?